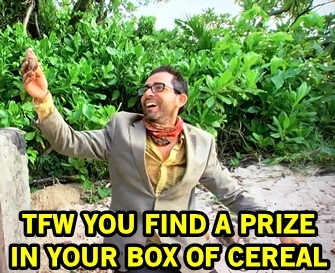 Survivor Heroes Vs Healers Vs Hustlers: What the Roark?! Before getting into the game of it all, Survivor has an excellent emotional moment to share after Ben is startled by the bamboo popping in the campfire. The former Marine explains how in war you see and experience things others won't and it's hard to go back to a normal life after. He hopes by succeeding on Survivor he can inspire other veterans and it's a beautiful human moment in a reality game show. Commencing game-bot mode. The Reward Challenge has iced coffee and pastry on the line and all it takes is doing the worm through the sand and shooting some baskets. Levu is able to come together after voting off Alan and win that beautiful platter of breakfast treats. Ashley and Devon give Joe credit for his surprising idol play, but begin putting their heads together for a way to sway Desi to oust Joe once and for all. Wary of Cole's blabbermouth tendencies and the tribe's growing irritation with him as a whole, Jessica and Mike begin to grow closer as allies when they successfully find the Hidden Immunity Idol at the Yawa well. Eventhough Ryan completely blows the challenge for Soku, but his social game is enough for no one to care about losing a vat of coffee and still wanting him as an ally. 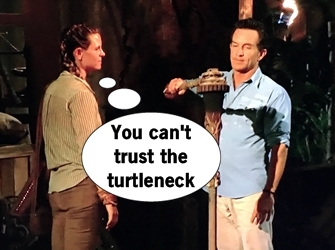 Ryan's position as the turtleneck-in-the-middle becomes crucial after Soku loses the Immunity Challenge. Chrissy and Roark talk strategy for the first time and Chrissy poses the idea of an all girl's alliance, which is all BS. Chrissy wants to vote out Roark and lies to JP that Roark is the one who suggested a girl's alliance. Ali, Ryan's ally from the Hustler tribe, wants to vote with Roark to eliminate Chrissy, who is weak in challenges. Ryan's in the middle of two pretty tight allies, neither of which wants to work with the other, and both think he's on their side. What's a guy with a smelly red turtleneck to do? Tribal Council time! Ali brings up that Chrissy didn't tag out of the challenge, but she insists she asked and everyone told her to keep doing that weird Swiss cheese puzzle. Chrissy admits today was the first time she talked strategy with Roark, who points out Chrissy waited to talk to her until she needed her, since Chrissy did talk game to everyone else. JP, poor bland JP, brings up the women talking together and fear of them aligning against the men. Roark thinks she's made enough bonds to trust at the vote and is the swing. Ali brings up a good point that this is Roark's first Tribal Council and voting is what really builds trust. Roark's first Tribal Council ends up being her only one as Ryan picks a side and votes with Chrissy and JP to eliminate Roark from the game.